Krissy: Oh, lord. I was talking to him the other day and he said that his cat had had kittens and that he thought that one of them was an albino. I said, “Oh, I’d like to see that.” I didn’t say I wanted it! Me: In that case, surprise, we have a new kitten. 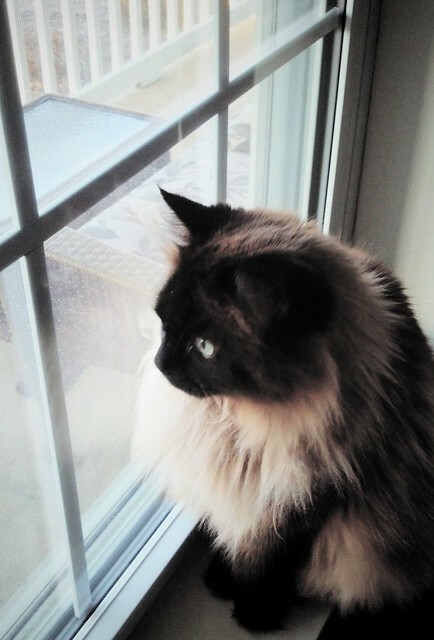 Also, as an albino cat Ghlaghghee was a bust, because she had markings that made her look like a Himalayan; for all of her life when people saw photos of her they complimented me on what a lovely example of the breed she was. She wasn’t. Her mother, who lived next door, was a mixed breed cat with tortoiseshell markings, and we strongly suspect her father was a Siamese mix feral cat who we would see wandering about the first couple of years we were here. 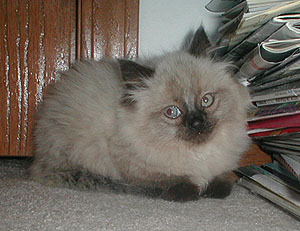 Ghlaghghee, despite appearances, was a common moggie, genetically speaking. But she was just about adorable, I like cats, and I sensed a real “no takebacks” vibe from Jerry. Deciding to keep her was not really a problem. We also decided that we would let Athena, age four, name the cat. More accurately, Krissy decided it, and I went along, with caveats. Specifically, that we would ask her to think of another name than something dreadfully boring, like “Fluffy,” because, honestly, we were a creative people, we Scalzis, and we could do better. I was not really down with the name “Fluffy,” but you try getting a four-year-old child to change her mind about a new kitten name and see how far you get. In this moment of domestic crisis, I turned, as I so often did, to the wisdom of George Bernard Shaw, who once commented that the English language is so nonsensical in its rules regarding pronunciation that one could spell “fish” as “ghoti” and it could still sound the same. Well, I could live with “Fluffy” if it was spelled “Ghlaghghee,” so that’s what I did. And thus our cat was named, and also twelve years of people asking how “Ghlaghghee” was pronounced and/or trying to pronounce the word as if their epiglottis was spasming. 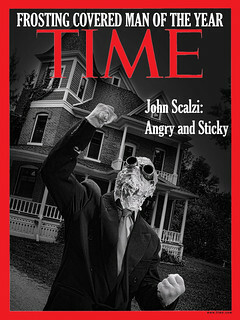 Which amused me, at least. That said, her cuddliness was highly contingent on who you were; she wasn’t much for strangers and even Athena she would sometimes treat as a person below her station. As for the other cats, well. She was the smallest of the three cats we currently have, but there was no doubt which cat ran the household. A prime example of this was the fact that Ghlaghghee had claimed my and Krissy’s bed as her space; if Zeus or Lopsided Cat tried who share it with her, she would make her displeasure with their presumptuousness clear almost instantly. For a decade, the bed was a no-go zone. She got along very well with the other cats, as long as they remembered who was boss. Ghlaghghee was always popular with Whatever readers, because she was a handsome cat who I would frequently photograph, but she became famous to the entire world in September of 2006, when I taped bacon to her, posted a picture of it here on the site, and for two days that post with a picture of bacon taped to a cat became the most popular thing on the English-language Internet. 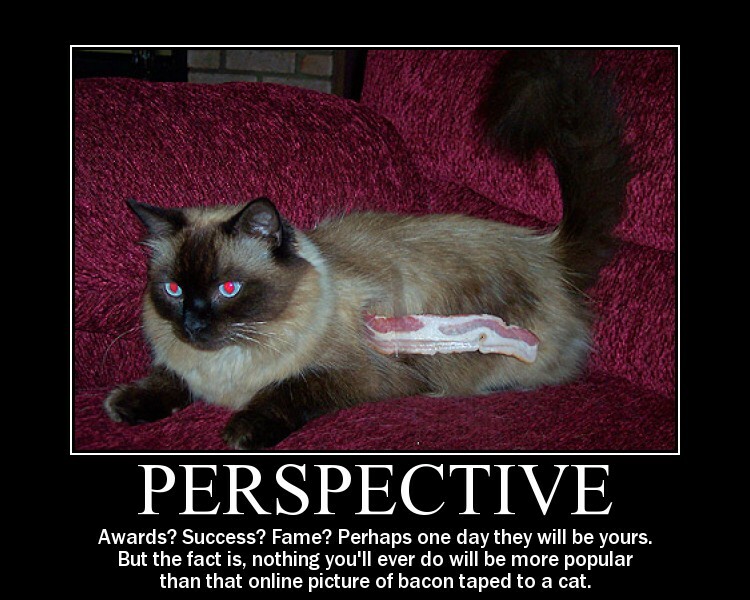 Looking back now, it’s difficult to believe that in all the time prior to that moment, no one had thought to tape bacon to a cat, and then put that picture on the Internet, but apparently no one had. The Internet loves bacon; the Internet loves cats. Combining the two was perfect synergy. Person I Don’t Know, Who I’ve Just Met: So, what do you do? Me: Well, I write books. 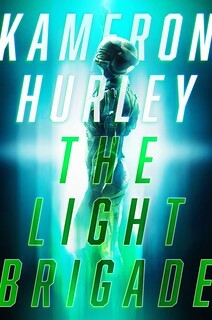 Science fiction books. My most famous one at the moment is called Old Man’s War. Person: Sorry, I don’t know it. Me: I also once taped bacon to my cat. Person (visibly excited): Oh my God! That was you?!? I love that cat! Ghlaghghee was written up in the New York Times and Wired and several other places; she was unimpressed with them all because she’s a cat and it’s not as if she actually cared about any of that stuff ever, and it never really occurred to me to try to keep my cat’s moment going. 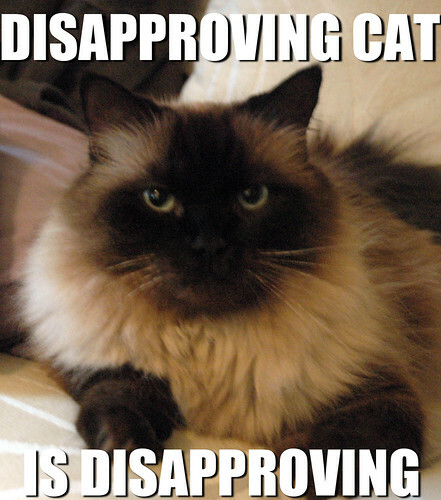 Ghlaghghee’s celebrity has long since been eclipsed by the Grumpy Cat and Lil’ Bub and other such creatures, which is fine. Ghlaghghee didn’t seem to mind. A quiet country life, with a few fan club members frequenting Whatever and a Twitter feed, seemed to suit her. Ghlaghghee always slept with me and Krissy on our bed, and then one morning in December we both realized that she hadn’t come up to sleep with us at all. I went looking for her and she was lethargic and wheezy. 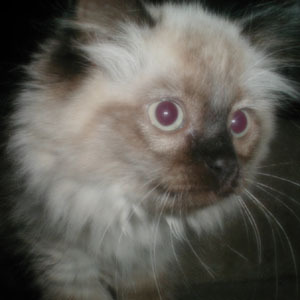 I took her to the vet soon after and she told us that Ghlaghghee had suffered from congestive heart failure. Ghlaghghee was not, on balance, a particularly old cat, but congestive heart failure can happen in cats at any point, and more frequently after middle age. Our vet gave us some medicine to help her clear out her lungs, which had been experiencing fluid backup, and let us know that we should be preparing for what comes next. Cats with congestive heart failure can sometimes live for a couple of years with the condition, but Ghlaghghee was not one of those cats. Literally overnight she went from active to feeble. It was hard to get her to eat or to do anything other than sleep. We did what we could to make her feel safe and loved. Yesterday it was clear that prolonging her life at this point made no sense. We made an appointment with the vet for Monday. Last night I made her as comfortable as I could, wrapped a towel around her to keep her warm, kissed her on the head and told her good night. I went to sleep and in the night had a dream that she had come to bed with me and Krissy again, sleeping between us as she often did. We buried Ghlaghghee in the back yard, by our maple tree there. She had lived literally her entire life, from the moment of her birth to the moment of her death, within two hundred yards of our house. She belongs here in death, too, in the place she knew, to become part of the landscape and to still be with us. I’m taking her death badly. I’ve had a month to prepare but as Krissy told me today, preparing isn’t the same thing as being in the moment. Pets are part of your family; you love them and in their way they love you back. 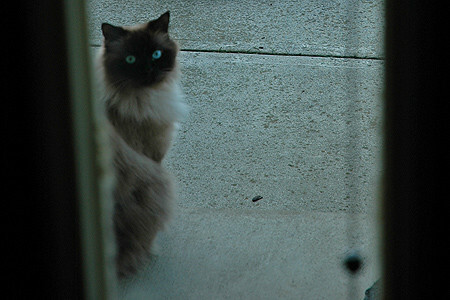 Ghlaghghee was indisputably my cat, and I’ve spent a dozen years with her, every day, as part of my life. I knew this was coming and I thought I was ready to say goodbye. 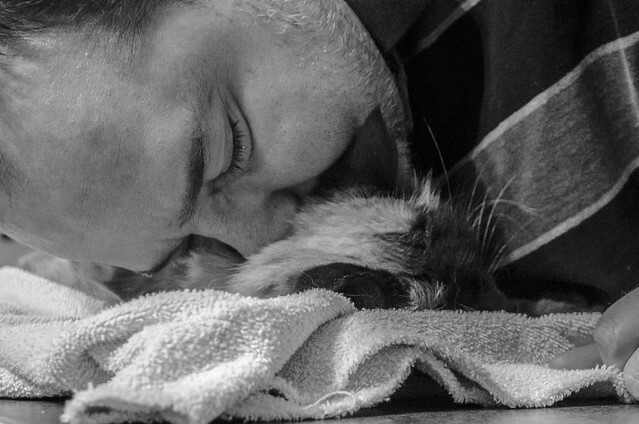 I was, but I wasn’t ready for how much saying goodbye to this particular cat would hurt. I suppose it’s just that I loved her a lot. And it hurts when those you love go away.